I’m working on a set for my daughter. Yesterday we went to Kantje Boord to buy fabric and notions to her taste and yesterday evening I made this thong for her. It’s Melissa’s free pattern (check the downloads) which is really easy to work with. Thank you Melissa for making this available. 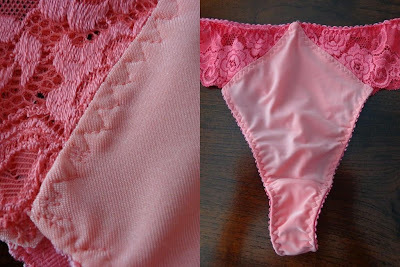 It’s the first thong I ever made, as I do not like them myself. My daughter likes them, and this one especially. Topstitching gave me problems and I’m asking you whether you know what could be the cause. My machine misbehaves sometimes and makes a number of short stitches and then continues correctly. It looks like the fabric is caught at the back of the sewing foot. It’s been to the dealer where of course nothing happens like this and he said my transparant foot with some damage on it might be the cause. I agreed the foot needed replacement so I bought a new foot. But when I was working on this it happened again on several places and I used the regular foot (metal) and the walking foot. Two different feet, same problem. So annoying. It’s a Bernina Aurora 430 machine. Any ideas of the cause or a way to avoid this? PS thank you all for your lovely comments on my jacket. It’s in the closet right now because we have very high temperatures here since about a week. No way I’m wearing anything with long sleeves. And those of you who bought the Craftsy course after my recommendation: I do hope you enjoy it as much as I do. I’ve been a bit reluctant of doing these reviews as they are only my perspective. The same is true for pattern reviews though, so I hope you all make a decision to buy something not only because I recommend it. Right now I’m following Kenneth D. Kings’s class for a jacket. I’ll write more about that in a later post. Sorry can't help with the skipped stitches other than trying a different needle. I have purchased KK's jacket class to but haven't started yet. Sigrid, sorry to hear your problem with the short stitches on your machine.. I recently had similar problem when trying to bind a neckline when stretched too much.. Was a nightmare removing the stitches and I just cut out the binding and sewed another one. I enjoy sewing your jacket posts as well. I have it in my -to-sew-some-day list and you are my inspiration for that. Can't wait to read about your review on Kenneth King fly coat. class. Have you changed the needle? An old, damaged needle or the wrong size may be a problem. Try a 9/70 or similar. Have you cleaned out the upper tension mechanism? Loosen it off and pull unwaxed dental floss through it in case a piece of lint or thread or dust is stuck in there. For English readers with the Same problem: try changing the lightbulb of the sewing machine. It sounds weird but it helped me to get rid of strange stitching problems like Sigrid mentions. What is the condition of your feed dogs? I had some trouble with varying stitch lengths and it turned out my feed dogs were worn down. Love your blog. Thanks for the review of the SA curve rulers, too. I got a set and am really enjoying the time savings in improved accuracy! Ik heb een pfaff dus ik zou het niet weten. Wat ik zou doen in dit geval is een ander steek kiezen of een gewone zigzag gaan gebruiken. I've had a similar problem with lycra fabrics (Burda 1000). In my case, I think that the fabric was not properly 'sticking' to the feed dogs. Usually sewing over a piece of tissue paper (crisp wrapping type) helps--although it can be annoying to pull the little bits out of tissue out later. A wash away/tear away stabilizer underneath would work too, but is a little more expensive. Also, just generally, I prefer (Schmetz) stretch needles over the regular ball point ones. I have this problem with my Pfaff once in a while too, changing the needle usually helps, I like the stretch needles (not ballpoint). Also pulling the fabric taut helps (be sure to hit it with some steam after). It might make some ripples when they aren't being worn, but won't when they are. I have no help for your sewing machine issues, but I loved Kenneth King's jacket class. It's one of the better classes I've taken. I am planning on making the jacket for the winter. I have had this problem at seam junctions when the machine did not want to sew over the hump. When the machine is straining put a ruler crosswise just under the foot at the back then the machine will keep stitching and push the ruler away. I hope this helps. What presser foot pressure is your machine set at? When fabric doesn't feed evenly, the stitch length becomes erratic. That can indicate that the presser foot is pressing too hard or too lightly on the feed dogs. I also have a Bernina Aurora. I generally loosen the presser foot (lower #) when sewing with knits or thick wovens, then tighten the pressure when I am done. For medium wovens, I generally use 40-45. For knits, I set it in the 30s. I hope you solved the problem and give me a tip! !